Fishing is the most popular sport in the United States and an enduring American tradition. It is also one of the most exciting recreational activities in the Greater Rochester region and New York State. 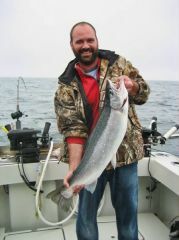 Lake Ontario has some of the finest trout and salmon fishing in the nation. 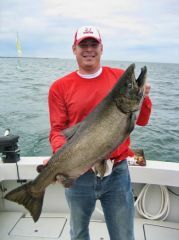 If you are looking to experience Lake Ontario Sportfishing for trophy salmon, trout and smallmouth bass, allow Hookedup Charters with Captain Bruce Stenglein to exceed your expectations! Captain Bruce Stenglein has been fishing the world class waters of Lake Ontario since 1977. Hookedup Charters is based in Rochester, NY on the Genesee River. 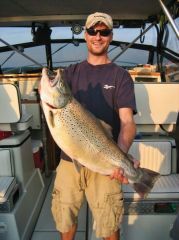 He has fished from the Niagara River to the mighty St. Lawrence River. The Genesee River in Rochester NY is the home port for HookedUp Charters. The Genesee River is located in the middle of the south shore of Lake Ontario. This location makes the Rochester Port the most consistent fishery on the Lake. No matter where the waves and currents come from, you always have options of where to go to catch fish. Many other ports don’t have these choices. Rochester also offers a wide variety of conveniently located and economically priced hotels and restaurants to choose from. Hookedup Charter trips are not a boat ride! I want to catch fish just as much as you do and I go the extra mile to make it happen. Remember all 8 hour trips are GUARANTEED fish or your trip is FREE. So what are you waiting for? Our spots fill up fast and we operate on a first come first catch basis so book today. Get Your NYS Fishing License Today – Now Available for Online Purchase! Hookedup Charters is based out of Monroe County in New York State. Be sure to stop into a local tackle shop when you arrive to pick up your fishing license. You can also purchase your license online. Please visit the following link to the DEC website that will guide you through purchasing a fishing license online directly. If you should have any questions about obtaining a fishing license in New York State, please feel free to contact us directly and we will be happy to help and further answer any questions you may have prior to your trip.